So, I picked up a Manga. This by itself is a bit unusual for me because I don’t often read them. I like my comics to go the same direction as the books I read. It may be a bit mono-cultural of me but this is how I read comics and I tend to prefer it this way. Which is kinda weird since I grew up with Japanese animation. Many of the cartoons I watched growing up and a good number of my favorites were the ones that came from Japan. I mean seriously, while many of the cartoons from home were a bit cartoony, the anime from Japan we had available were telling better stories with more realistic animation. They had a feel to them that captured quite a bit of the fantasy and science fiction that was building my preference map of storytelling. Actually, this trip down nostalgia lane comes from a comic I picked up recently. Yes, it is a Manga. 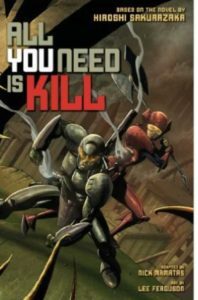 All you need is Kill (Viz Media 2014 for the 2 in 1 edition) was created by Hiroshi Sakurazaka. And if you didn’t know, was the basis for the Tom Cruise movie Edge of Tomorrow. And I am pretty sure I knew it when I first saw the movie but it did slip my mind because it wasn’t something I was looking for at the time. And then I started reading the comic. As I was digging through the thing I am having all this huge feeling that I have experienced this all before. So I had to check it out and after a few searches later, I was on a mission to see the movie again. You would think this would mean I could spend some time now comparing the comic to the movie and pointing out all sorts of similarities and differences. The thing is, about the only thing that is similar between the two different mediums is the battle with the alien mimics, the main characters, and the idea that they are stuck going back in time every time they die. After that, everything has gone off the rails. It feels like two entirely different stories. Even the way the main character comes into play is completely different. In the movie, Tom Cruize’s Character is a military liaison that works with the media to promote the war effort. And in the book, he is a recruit who hasn’t seen combat. There was an effort made to keep a little continuity between the movie and the comic but really, the connections are so superficial that it is better to just think of them as two different things. This isn’t to say that either one is a bad way to experience the story. I liked the movie when I saw it the first time. Granted it didn’t do as well at the box office as you might have expected, but that doesn’t stop me from enjoying a story at times. The book though, it pulled me in and I couldn’t put it down. There were a number of times in each story where they drove home the point that the characters were reliving the same day over and over again. In the comic this is driven home as we see the story in a much more personal way through the main character’s eyes. Through this intimacy when the key plot point comes into play we feel it on a much more personal level. While the similar plot point in the movie happens in a much different way the results from it would have a similar result to the comic. Though when it comes down to it, the movie ends in a different way than the comic. Of course, this only serves to show how different the stories are.